Protein is essential for building, maintaining and restoring your muscle, especially if you're active. There's a lot out there about what types, how much and the timing around it. So I'm going to make it simple and you can take it or leave it, but do read it. Eat protein in the morning to recharge with nutrients. Protein also satiates the appetite so you are less likely to find yourself craving jelly beans at 10am. This can be as simple as milk (protein fortified is good), a handful of nuts, miso soup or soy-based cereal. Rolled oats (WHOLEGRAIN) or eggs (boiled or poached!) are also a fabulous source of protein. Consuming protein before a work out kickstarts muscle synthesis (repairing and building muscle) throughout and even after hitting the weights. Drink chocolate milk after a workout. Eat within half an hour of your workout. A milk-based smoothie is an excellent choice. Throw in some berries and you've got an antioxidant fix too! Eat a fish, lean meat, soya/tofu based lunch. Go heavy on the protein in the middle of the day to ensure you have the energy to restore from your morning and have ongoing energy through the afternoon until evening. Don't ruin your meal by choosing high-fat, overly processed foods and please don't think a protein bar is a healthy choice. Yuck. Choose lean meat with a high protein content, like chicken, beef, lamb or kangaroo. Trimmed of fat, these are power foods. Combined with fresh vegetables and a healthy choice of fat, you have a well-rounded and nutrient rich fuel for living. Healthy fats might include avocado, walnuts, coconut oil or inherently omega-3 rich foods like salmon and trout. Snack on protein before dinner. A 250g tub of yoghurt, a smoothie, a handful of walnuts... your body will use the protein to repair and rebuild overnight. Eat a protein-rich dinner. All the lunchtime protein options are great. You might also include a chickpea or kidney bean salad, quinoia or boiled egg. 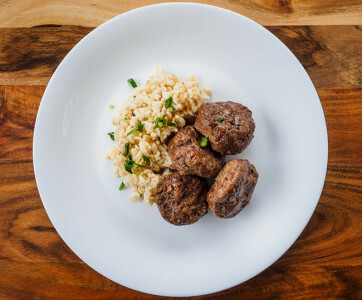 Great picks: Salmon, Skinless Chicken Thigh, Wholegrain Rolled Oats, Kangaroo fillet, Quinoa, Eggs, Steak, Chickpeas, Homemade Protein Balls or slices.